Carpal tunnel syndrome is a common source of hand numbness and pain caused by compression of the median nerve. The carpal tunnel is a narrow, tunnel-like structure in the wrist. The bottom and sides of this tunnel are formed by wrist (carpal) bones. The top of the tunnel is covered by a strong band of connective tissue called the transverse carpal ligament. 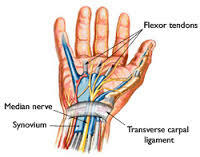 The median nerve travels from the forearm into the hand through this tunnel in the wrist and can become irritated by the tendons that bend the fingers and thumb that also travel through the carpal tunnel. Difficulty or pain with griping, twisting, etc. The thoracic outlet is the space between your collarbone (clavicle) and your first rib. This narrow passageway is crowded with blood vessels, muscles, and nerves. Spasm and shortening from the pectoralis minor muscle can be a common source for compression to these vascular and nerve structures. At times people are born with an extra set of ribs called cervical ribs which can also compromise this space. Sometimes weak uscles in your chest are unable to hold the collarbone in place, putting pressure on the nerves and blood vessels that lie under it. Symptoms depend on which nerves or blood vessels are compressed. De Quervain’s tendinosis occurs when the tendons of the extensor pollicis brevis and abductor pollicis longs muscles become injured and inflamed. 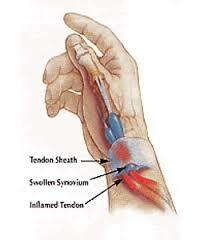 Swelling of the tendons and the tendon sheath can cause pain and tenderness along the thumb side of the wrist. This is particularly noticeable when forming a fist, grasping or gripping something, or when turning the wrist. Pain may be felt over the thumb side of the wrist. The pain is usually worse when the hand and thumb are in use. This is especially true when forcefully grasping objects or twisting the wrist. Swelling may be seen over the thumb side of the wrist. A wrist sprain is an injury to a ligament. Ligaments are strong bands of connective tissue that connect one bone to another. A wrist strain is an injury to the muscle or tendon. Tendons bind muscles to bones. Both are a common injury. There are many ligaments and tendons in the wrist that can be stretched or torn, resulting in a sprain or a strain. This occurs with an acute injury like a fall or can happen due to repetitive overuse jobs requiring the use of hands. Wrist sprain symptoms may vary in intensity and location. Trigger finger limits finger movement. When you try to straighten your finger, it will lock or catch before popping out straight. 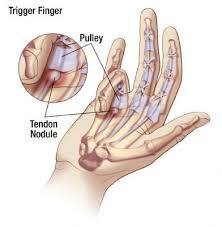 Trigger finger is a condition that affects the tendons in your fingers or thumb and progressively worsens over time. The tendon sheath attaches to the finger bones and keeps the flexor tendon in place as it moves. Injury occurs when the tight tendons rub in the protective sheath causing friction and gradual wear and tear. 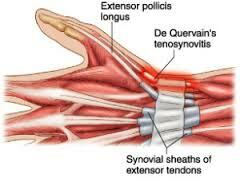 Tendonitis and tenosynovitis are types of tendon injuries. They often occur together. The most common cause is overuse of the affected tendon. Most of the time there is an injury, or several repeated small injuries or tears, to the tendon. This may initially cause some inflammation of the tendon. But, in the longer term, if these repetitive injuries continue, it can lead to tendon damage (degeneration). Computer work has become one of the leading causes for these conditions. Tendonitis and tenosynovitis are types of tendon injury. Tendonitis means inflammation of a tendon that involve acute injuries accompanied by inflammation. Tendinosis means chronic degeneration of a tendon without inflammation. This is from failed healing of repetitive minor injuries rather than acute injury.